Okay, we've all given out the names of our favorite brews- now I'd like to give us a chance to save a bro/sis a few bucks and and advise them of what we think came from somewhere besides a brewery. Since I'm (and maybe you are) not good at remembering them, this may be updated periodically as we come across them. "In terms of session beer... no way. But a single beer after work, definitely yes." LOL, I buy a 6 of that every few months. Granted, I am partial to IPA right now, but I like it. Yeah, we do run the risk of offending someone else's preferences here, and if I & the family hadn't tossed the rest of that 6, we'd've been glad to send it to you. Still, don't be afraid to say what you don't like here- someone else with similar taste may be grateful in knowing what to avoid . 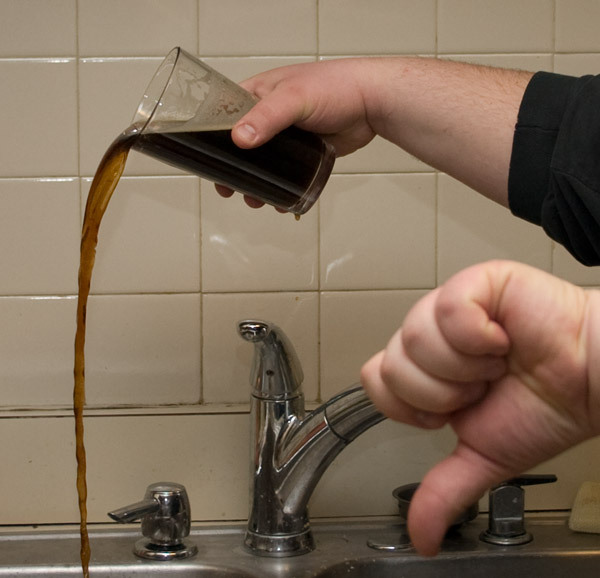 I'm really, really not a big fan of Shinerbock...yeah I know whatever it's mass produced, but I have friends who drink it like water and I'm like...gagging to death. this beer fails in so many ways that your heart is so broken it cant handle that it's an ok beer....if you dont expect ANY pumpkin flavor. Oh, my bad, the question was about beer. OK back on topic. Qeldroma, it may be that you just don't like India pale ale recipe beers. I'm not too fond of them either, from any brewery. I recognize the ones I've tried as finely crafted beers, but the style just doesn't appeal to me. IPA was developed for British sailors for long sea routes, such as England to India. Those passages could take many weeks, or even months, and the extended storage time in barrels in combination with hot summer weather near the Indian subcontinent would render the traditional ales stale before the long voyages ended. The brewers discovered that doubling the hops would produce beer resistant to spoilage. The flavor that you find distasteful is probably the intense hops. Ibita's Purple Haze. Nasty stuff. Thought my wife would like it, but I was wrong. Bare Knuckle Stout. The worst stout I have ever tasted. I would rather drink a Guinness from a can or bottle than this crap. How ever, I will say that when mixed half and half with Amberbock (Amberbock then Barenuckle poured properly) I makes a nice black and tan. But just straight Bareknuckle.... wretched. I had a bare knuckle Stout in a Black&Tan with Bass, very nice. Not had one alone to comment. Oh and any beer that its main sell is fruit. Just because its called Apple Brew, does not make it beer nor does it make it tasty as it may sound. The sole exception to this rule is the Unibroue Éphémère. Apple and Black Current both very tasty, though I can only have a 12 oz to sip on. They come in 750ml bottles but its just to much. This is the best Anheuser-Busch beer I've ever had. It exists solely to compete with ShinerBock in Texas and it fails horribly. It is watery, over carbonated, and the worst part is I have 5 more. I completely disagree. Not to be had by the case, but it's definitely something I enjoy having a few of around the holidays. I hunt down a holiday variety case whenever I can to secure 4 of them (plus, what was it, the [strike]Yuletide[/strike]? Holiday Porter! Those are good in small annual quantities as well). Now, their Cranberry Lambick (also in the same variety pack last I got one) is to be avoided at all costs! Horrid beer. It's awful. No lie. You can have all of it when I find a variety pack this winter. Pronounced like the sounds I made when I was ghoosing all over the place: "Raaaaauuuuuuuchhhhhh!" I just wanted to add another beer to this. Jinx from Magic Hat Brewing Company. I've never seen it in more than a variety pack, but man the stuff tastes like it was smoked...literally, over a fire. I've never had a beer with such a smokey taste. It's awful.